Baitcasters for Brookies? You can't be serious. I'm serious! The Tenryu Rayz RZ53UL-BC baitcaster is rated for lures as light as 1 gram and line as light as 1 pound test. The Shimano Trout One NS B50UL is rated for 1 gram lures and 2 pound test line. If those aren't little wild brookie numbers, I don't know what is. Casting a one gram lure with a baitcaster was unthinkable before the advent of Bait Finesse System (BFS) reels. Even with the best BFS reels, aftermarket spools are necessary for the average angler to be able to cast 1 gram lures. I may be a BFS Bum, but I'm certainly no pro. I have a Shimano Aldebaran BFS XG, for which I bought the Avail 16ALD15R replacement spool. With that spool the Aldebaran BFS XG is said to cast lighter lures than any other baitcaster. I took it out yesterday for the first time since installing the Avail spool. It was indeed an eye-opener. No brookies were caught in the making of this report. That is only a matter of time (and going to a stream that actually has brookies). I went to a stream where I knew I would not be bothered by large trout. It isn't actually a headwaters stream, but with a flow of only 9 cfs and a population of 5-7" wild trout it might as well be. Having already admitted to cheating on the stream (no brookies) I may as well confess that I didn't actually use 1 lb line. I spooled the Aldebaran with 9X tippet, which has a stated breaking strength of 1.6 lb. For most of the time, I didn't actually fish with a 1g lure, either. Most of the time I fished with a 1.2g Daiwa Presso Lupin spoon. I did try a 1g lure briefly - the Cultiva JH-85 .7g jighead and 1.3" Cultiva pinworm, which together weigh exactly 1 g. Although I've caught trout with that lure I generally do better with micro spoons, so I didn't fish it any longer than it took to realize I could indeed cast it. I then tried a .9g Forest Marshal Tournament spoon, with which I got a hit on my second cast. I missed the fish, but it proved that I could cast a .9g micro spoon with a baitcaster, and far enough to catch fish! I switched to the 1.2g Lupin spoon because even though I could cast the .9g Marshal Tournament spoon far enough, I didn't have acceptable accuracy. I was fishing a fairly large pool, so while it would have been nice, pinpoint accuracy was not actually required. For the rest of that stream, though, errant casts would have meant lost opportunities at best and lost spoons at worst. The stream I was fishing flows into a reservoir that has a good population of large mouth bass. Although I hadn't caught a bass in the stream before, it was only a little surprising that the first fish I caught with the 1.2g, 1.6lb, Aldebaran combo was a little large mouth bass. A least it was brookie sized. 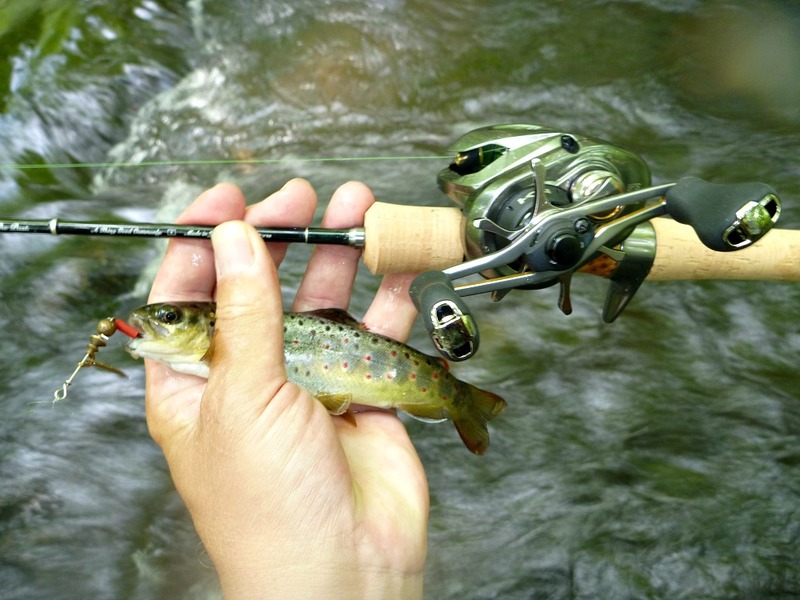 Fishing was slow, but I did manage to catch a little brown trout, which shot out from under a log to grab the silver Lupin spoon. If you can catch a 6-7" wild brown trout from under a log in a 9 cfs stream, I'm going to take that as confirmation that "baitasters for brookies" is a reasonable approach. Backing off a bit from this article's opening paragraphs, you don't actually need to cast 1 gram lures, and you don't actually need to fish with 1 or 2 lb test line. The above shot was taken in June of 2017. The reel was straight out of the box, with no aftermarket parts. The line was 3 lb Sunline Troutist Wild rather than 1.6 lb 9X tippet. The lure was a standard Mepps size 0 spinner (1/12 oz, 2.5g). How many brookies have been caught with a size 0 Mepps over the years? Has to be in the thousands. Many thousands. And I was a rank beginner with a baitcaster. It was the second time I'd fished with a BFS reel and just a few weeks earlier was probably the first time in over 20 years that I had fished with a baitcaster at all. That shot was taken before I stopped fishing treble hooks - actually that fish is largely WHY I stopped fishing treble hooks. 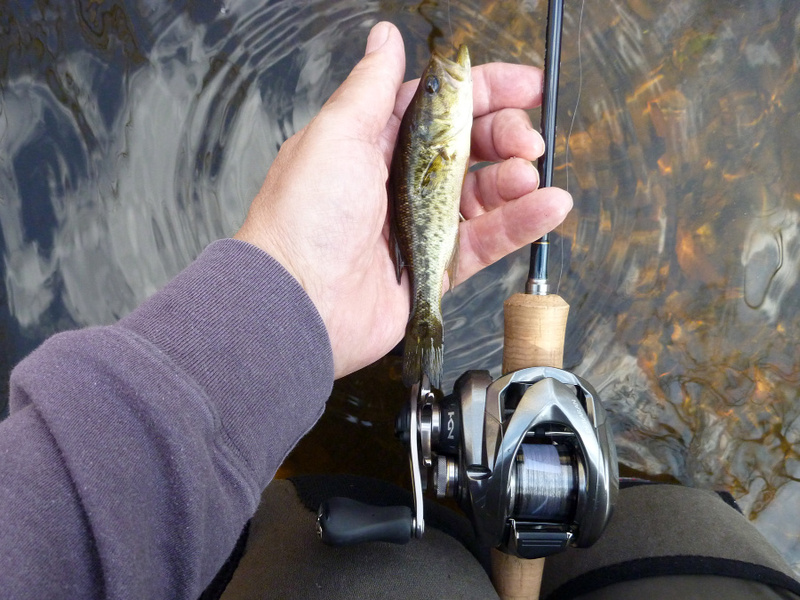 I wouldn't fish a Mepps spinner again, and I prefer spoons to spinners in any event (less line twist), but the point is that a straight-out-of-the-box Aldebaran and a Tenryu Rayz RZ53UL-BC or Shimano Trout One NS B50UL will cast a 2.5g lure (which is small enough to catch 5-7" trout), and will cast it plenty far enough to catch fish in the tiny streams where little wild brookies live. Baitcasters for brookies is not an outrageous thought. 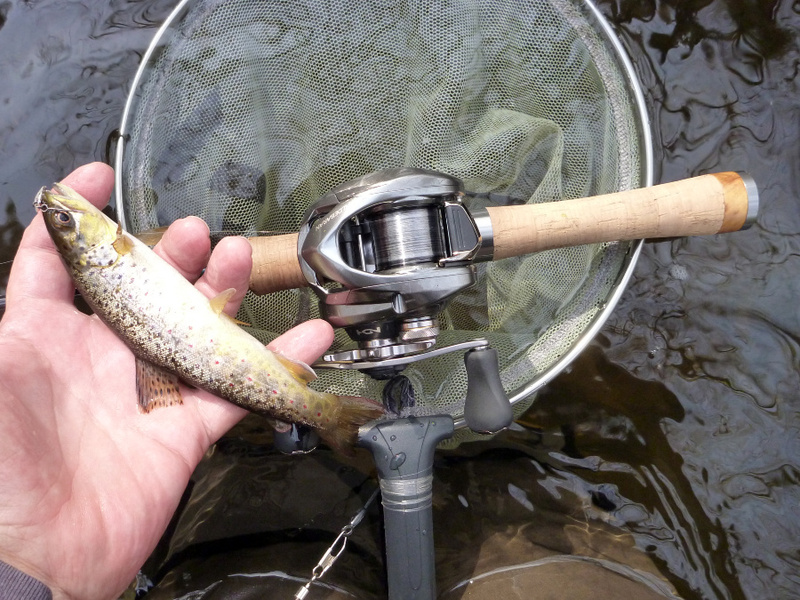 With an ultralight rod and a BFS reel, you can fish small streams with small lures. For my own fishing, though, I'm going to make at least one change. No more 9X for me. On this trip I really, really missed having a hi-vis line. With thin, clear tippet material for my line and with such a small lure, it was often impossible to see the lure in flight. On many casts, the only way I knew where it landed was seeing the splash. In a pool, that's not a problem. In riffles, even gentle riffles, seeing the splash of a small lure might be impossible. Even more important than that is seeing where the lure is going before it gets there. When casting to small targets near shore or near logs, you need to be able to stop the flight to prevent losing lures to snags. For almost any cast in a small stream, though, you have to get the distance just right to make sure the combination of the current and your retrieve will allow the lure to follow path you intend. A baitcaster (and an experienced thumb) gives you excellent control over casting distance, but for that control to be of any value you have to see the lure in flight. With smaller lures, that pretty much means hi-vis line. I think I'll spool up with the Varivas Bait Finesse PE. It has the best trade-off of high visibility and low diameter. Once I get that done I need to get to some brookie streams. Baitcasters for brookies just might become a recurring theme.